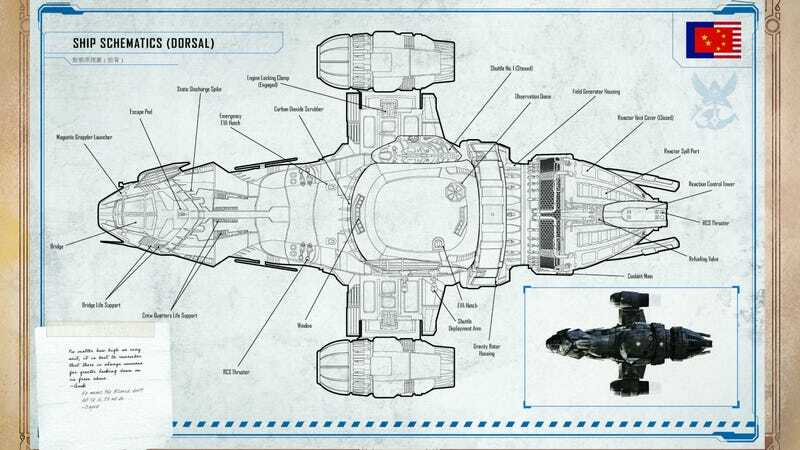 The layout of Serenity thanks to a new in-universe Firefly book. While Joss Whedon’s Firefly is not likely to come back anytime soon, the franchise continues to live on. Two great examples are these in-world books from the world of Firefly, including a guide to everyone’s favorite ship, Serenity, and the ’Verse at large. Better yet? We’ve got your first looks at each. The cover of the Serenity Handbook. Two pages from the Serenity Handbook. Serenity in all her glory. The cover of Firefly: A Traveler’s Companion to the ‘Verse. The beginning of Firefly: A Traveler’s Companion to the ‘Verse. Two pages of four concurrent in the book. The second two pages of four concurrent in the book. Both books are published by Insight Editions. The Serenity Handbook: The Official Crew Member’s Guide to the Firefly-Class Series 3 Ship is out July 3, while Hidden Universe Travel Guides: Firefly: A Traveler’s Companion to the ‘Verse arrives August 14.